On today's episode of PrepperCon Radio Scott, Brian and I discussed the topic of concealed carry and the best prepper guns. I know I say this every week. There is never enough time to get to even a fraction of what we could talk about so we just barely skim the topic. Leaving, I suppose, many listeners hanging. So, I will expand and expound on what we talked about today. Concealed carry is the topic. What kind of hand gun do you carry? Why did you choose to carry that particular pistol? It's quite likely that you, through your years of experience, and through trial and error, have owned a number of handguns which have worked for you and some that haven't. 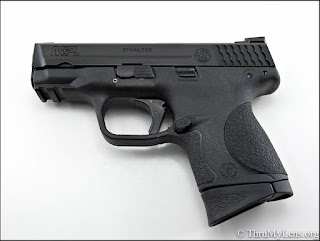 Did you buy a pistol that was just too big and heavy for you to carry concealed? Have you purchased one that was too small or too difficult to shoot accurately? Did you find the one pistol that fits your hand perfectly, can shoot extremely well and wish you could carry it with you wherever you go? Well, that's what I did. I started out by buying a small 'pocket' pistol because I assumed that it would be easier to conceal, and they are pretty darn cool. I quickly realized that they are not very fun to shoot, beyond 7-10 yards they are not very accurate, they don't hold many rounds, they don't typically have all of the features or full size semi-autos, among other disadvantages. The advantage of a pocket pistol is that they are very easy to carry and conceal. Which for many people means that they can always have a gun with them. That is very important. If it comes down to either having a pocket pistol or none at all, a pocket pistol it is. However, I don't think that has to be the case. Now, of course, depending upon your work circumstances, what you are required to wear, and other factors, it may not be possible for you to carry a full size frame pistol. Or is it? I'm gonna argue that. My argument is that more people could be carrying a more capable, more comfortable, more fun, more effective handgun than the pocket pistol that they are carrying right now. First, why should you choose a full size frame pistol? What I mean by 'full size' is a semi-automatic pistol that has a 'double stack' magazine and at least a 3" barrel. These pistols may have a 'full size' grip or a 'compact' grip. A full size grip allows for all of your fingers to wrap around the grip where as a compact grip will only allow two and maybe a part of your pinky finger. 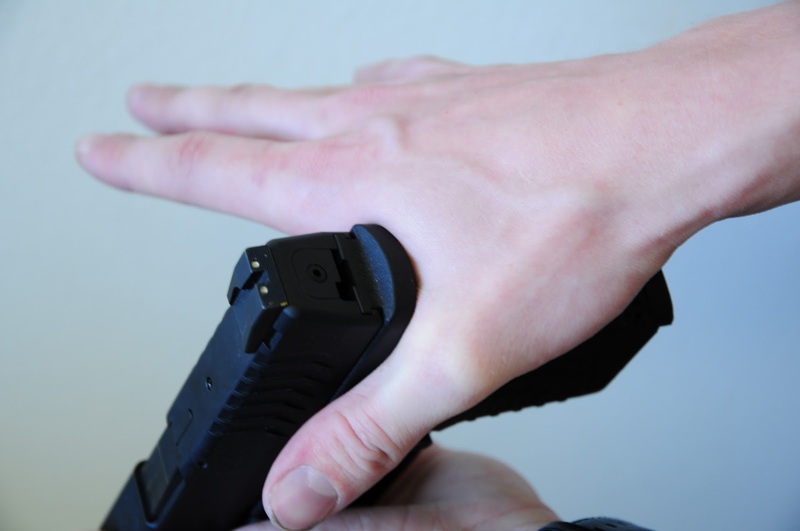 A full size grip allows for better control and grip on your weapon and the compact grip can easily accept an extension onto the magazine for your pinky. Compared to a single stack magazine the capacity may be half or less of what the compact magazine holds. The advantage of more rounds in a magazine is not to be underestimated or undervalued. Even the police have a very low percentage of hitting their target when in a gunfight. So why would you limit round capacity? More is better. When it comes to malfunctions, semi-autos have em. Some more than others. To quickly and safely correct malfunctions and quickly return to firing takes lots of practice. A bigger pistol is just plain easier to learn manipulate than a pocket pistol. When it comes to proper grip on a pistol you just can't achieve that grip on a pocket pistol. This means that you can not be as accurate or as consistent as easily. Why make it harder than it has to be. Here's a picture of one of my favorite instructors, Chris Costa showing how it's done. To manage recoil and get back on target the fastest, this is the form you should follow. Because pocket pistols are so much lighter, even though they are a smaller caliber, the felt recoil is greater than that of a larger caliber full size pistol. That you can't grip it properly means your follow up shots will be much slower and less accurate. It quite literally will take 1000's of rounds down the barrel of your concealed carry weapon in order for you to come to know it intimately. Believe me, you want and need to come to know that handgun like it is part of your own body. When you reach through your cover garment to locate your weapon with the space between your thumb and index finger then wrap your fingers around it firmly the first time, without having to re-position your hand after your pistol leaves its holster and then draw it out to meet your other hand with the proper grip and then extend it out to the target, you then must replicate that motions thousands of times until you can't get it wrong. I just don't see that being possible with a pistol the size of your hand. I admit, I am not a handgun instructor nor have I shot the majority of pocket pistols that are available but the ones that I have, which include the S&W Bodyguard .380, Beretta 3032 Tomcat, Ruger LCP and Kel-Tec PF-9. From my experience it's just not possible to do with a pocket pistol what you can with a full size. This can put you at a big disadvantage. When it comes to a gunfight you need all of the advantages you can get. Capacity, accuracy, consistency, function. Why settle for anything less when you don't have to? 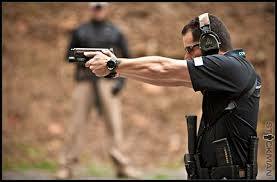 Ok, if you're really not that into self defense, if you really don't train hard and often enough to be super proficient with your sidearm, and I mean THE pistol that you carry with you every day, then maybe a pocket pistol is the right handgun for you. If you take it to the range every few months and shoot a box through it and call that good then by all means. Personally, I take my protection, my families protection, and the defense of everyone I happen to be around at the moment and where ever I may be, very seriously. Even to the point of what some people would call obsession. I spend time every day, every day, honing at least one aspect of my skills. Are you any less committed than this? If, by chance, I am forced to draw and use my handgun, my chances of coming out on top will be much better than the bad guys because of the weapon I carry and because of my training. I don't plan on getting lucky. Regardless of what you carry I urge you to carefully consider, beforehand, the situations in which you would un-holster your pistol. It is ALWAYS best to de-escalate. In many cases it may be best to turn and run. But the one time you NEED it you had better have it with you and on your body. If your only option is a pocket pistol, it is better than nothing. But, i'm telling you, that, in more cases than not, what you carry CAN be better that a pocket pistol. It is my observation that many owners of pocket pistols see the trend and their popularity and think that since they are so popular than one should be good enough for me. That it's so EASY to just stick it in a pocket or purse. I also see that people are not willing to change the way they dress, however minor the change may be, or are not willing to carry a 'big, heavy' gun because they perceive that it would be uncomfortable and bulky. Well, that's your choice and thus the reason, I guess, that pocket pistols are so popular. For me, I feel the need to do more than that. Thus also the reason for this post. Consider compact semi-automatic handgun models such as the Springfield XDM the S&W M&P, Glock 26 or 27 or Ruger SR9 or SR40c. 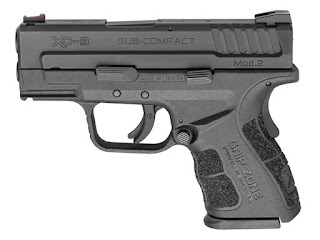 Consider a sub-compact such as the Springfield XD-9 Mod 2, M&P9c or Beretta PX4 storm. These are my primary recommendations to start. These pistols all have additional full size magazines which provide for a full size grip in addition to the compact magazine. The key to carrying these larger handguns is choosing the right holster for you and possibly adjusting how you dress. If you don't wear a sturdy belt you won't be able to carry these inside your waist band. Inside the waist band is where I prefer to carry concealed, at about 4 O'clock on my strong side. Also consider appendix carry. If you wear a suit and dress shirt you can absolutely carry any of these pistols comfortably. Ladies, if you don't wear jeans or slacks that allow you to wear a belt I don't have any immediate recommendations for you, but like for us guys there are many, many options for you to carry concealed. Consider the Galco King Tuck, the Alien Gear or Stealth Gear tuckable holsters. There are also many other inside the waist band tuckable holsters but these are the ones that I can speak to. They are very comfortable and when positioned right no one will ever know that you are carrying one of the models i've listed above. Get down to your local shooting range and check out their rental guns. I guarantee that they will have most of the models I've listed above for you to try. Don't get rid of your pocket pistol just yet. Carry your new full size and also carry a pocket pistol as a back up or to arm someone else.